Is it normal to be baptised on same day as birth? I'm looking at a transcription of a baptismal record from September 18, 1866 that lists the birth as also being September 18, 1866. Is it normal for this time period to be baptised on the same day you are born? Alternatively, could the record just not have exact day, possibly two days earlier as I've seen for several others, that he was baptised? Since the baptism record transcript has a field for birth date as well the baptism date, probably THIS child was baptised on the date of birth. At this point, you probably have seen a wider range of examples for the region and time-period in question than anyone else here. You could create your own analysis. See Average time between birth and baptism in the Church of England? for an example. Related: How soon after birth would Roman Catholic baptism normally occur in early 18th century Germany? Addendum: According to FamilySearch Wiki, Slovenia Civil Registration did not start until 1868. Anyone born before that would be dependant on church records for official documentation of their birth. 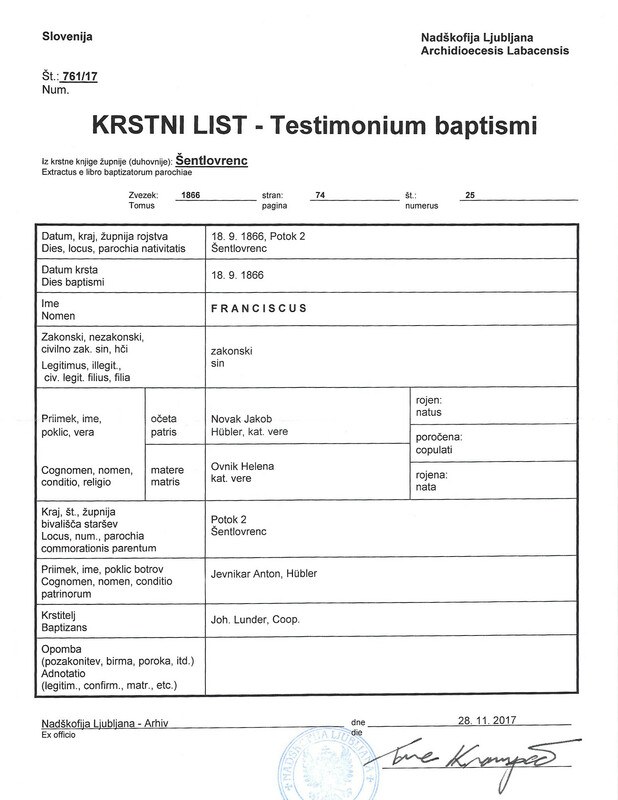 If the baptismal record did not include the birth date (and they sometimes did not), the baptismal date would be assumed to be the birth date. In my investigations in Spanish catholic records I found that the difference is on the order of 1 week. And, when baptism occurs at the same day or the day after is very often (around 80%) a clear signal that the baby was born dead or died that day or the next one. If we think a similar behaviour might happen in Slovenian church I would recommend to crosscheck the dead/burial records to confirm that the baby did not die. Crosschecks also to mention are to check is the same couple had another child with the same name later on (a common practice in the past after the death of a child) and to confirm there is no major christian celebrations in the coming days after the baptism (like Easter or local celebrations) which sometimes led to early baptisms. If that was an English registration I would suspect a very sickly baby that was not expected to survive long enough for the usual gap to baptism and the priest was called to ensure the child's soul didn't go into purgatory. Not the answer you're looking for? Browse other questions tagged 19th-century baptism-practices austria-hungary or ask your own question. Average time between birth and baptism in the Church of England? How soon after birth would Roman Catholic baptism normally occur in early 18th century Germany? Why was Flossie baptised twice (1898,1903) at Stalbridge, Dorset, England? Genealogical records from Rensselaer county? Was it common for parents to baptise a baby/child if they knew he was sickly and likely going to die soon? How did two birth records from the same sub-district end up in different districts? What are the names in this Status Animarum from Slovenia? Would a deceased father be named on his child's baptism record?